Panoramic view from the Kabbale hill. Trail to Kabbale is not too tough, and will let you enjoy the beauty of this forest first hand. 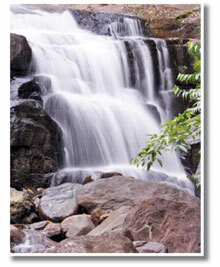 The beautiful cascades of Anagimale falls. The streams have lost most of their water retaining capabilities due to de-forestation in the 1970s and therefore the true beauty of these waterfalls are rarely seen today. After a shower of rain in the forest in the afternoon, the sun breaks in creating a magical feeling. Not only when light filters through the wet trees, it is also interesting to see it lighting up the fallen leaves on the ground too. It is indeed a mesmerising sight and has to be seen to be believed. Kanneliya Forest Reserve located in the Galle district is the largest of the KDN, or Kanneliya-Dediyagala-Nakiyadeniya, forest complex. Kanneliya is regarded as one of the most biologically diverse areas in the country (as well as in the world). 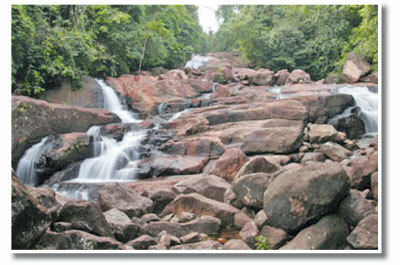 The bio-diversity of Kanneliya is considered richer, even compared to the world heritage rain forest "Sinharaja". Most of Kanneliya today is a forest that had recovered from selective logging that had happened in1970s. The water falls in the forest are now recovering with a numerous streams adding life to the diverse vegetation and some what hilly landscape. These streams create several beautiful cascades inside the forest. They also provide ideal opportunities for a nice cool dip in some of the purest streams in the whole world! Kanneliya is a tropical lowland rain forest is 35 km North East of Galle . The Kanneliya forest covers about 5305.9 ha and core unit of the Kanneliya Forest Reserve is about 5108.2 ha. Kanneliya lies between 6° 09 - 6° 18° N and 80 19° - 80 27° E. Kanneliya is very important to biological diversity. 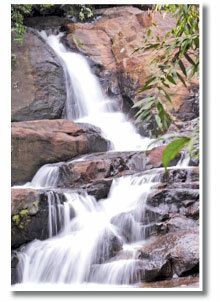 Several waterways, waterfalls, rivers and small waterways are found in Kanneliya. The Gin Ganga is the main and biggest waterway of the Kanneliya Forest Reserve. The forest has been subjected to selective logging from 1940 to 1987. Therefore, The forest department has developed a plan to manage and develop the forest. 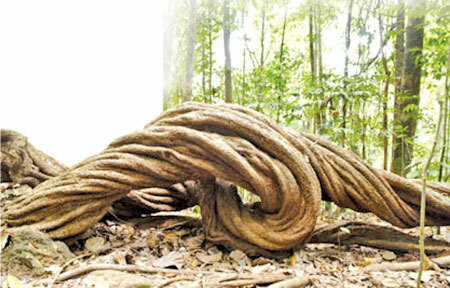 Many plants are endemic to Kanneliya among the 234 identified woody tree species, with 141 being endemic to Sri Lanka. Totally there are 301 plant types in the Kanneliya Forest Reserve. Some 133 faunal species with 59 birds, 14 amphibians 32 butterflies, 7 snakes and 10 mammals. Along with the new conservation initiative this forest seems to have got a reasonable regeneration and rich bio diversity as mentioned above. 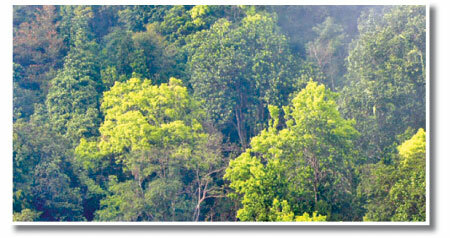 The importance of Kanneliya Forest Reserve Kanneliya is important that it's a main tropical rain forest of Sri Lanka. 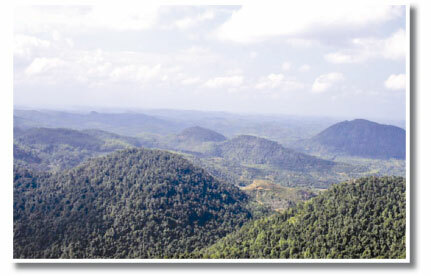 Because of such forests Sri Lanka entered the top 25 hotspot list. KDN complex and the Sinharaja are tropical montane rain forests of Sri Lanka and several species are hidden in the dense jungles.